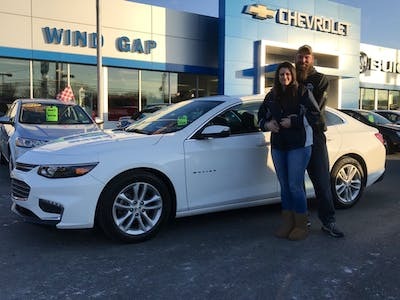 At Wind Gap Chevrolet Buick, Our purpose is to create a positive, respectful and welcoming environment that leads us to serve our employees, customers, and community. 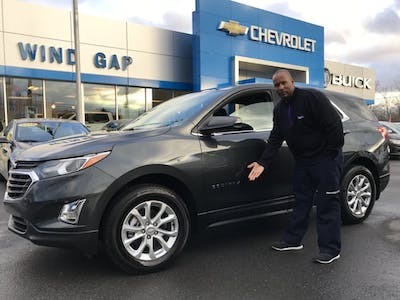 Located on S. Broadway in Wind Gap, in the Slate Belt community, Wind Gap Chevrolet Buick is your one-stop shop for new cars and trucks and Allentown, Easton, and Stroudsburg used cars. From our convenient location on the border of Northampton County and Monroe County, we serve drivers coming from all over the Lehigh Valley and Poconos areas. 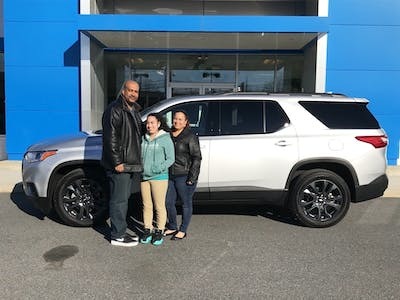 Easton Buick and Chevy shoppers come to us, and we even attract customers who are fed up with their local Allentown and Stroudsburg used car dealers. 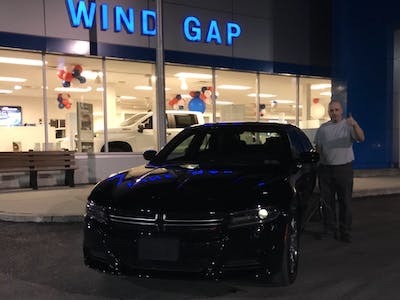 We get so many out-of-town shoppers because customer service is our number-one priority - our friendly staff will make your visit to Wind Gap Chevrolet Buick a pleasant one. 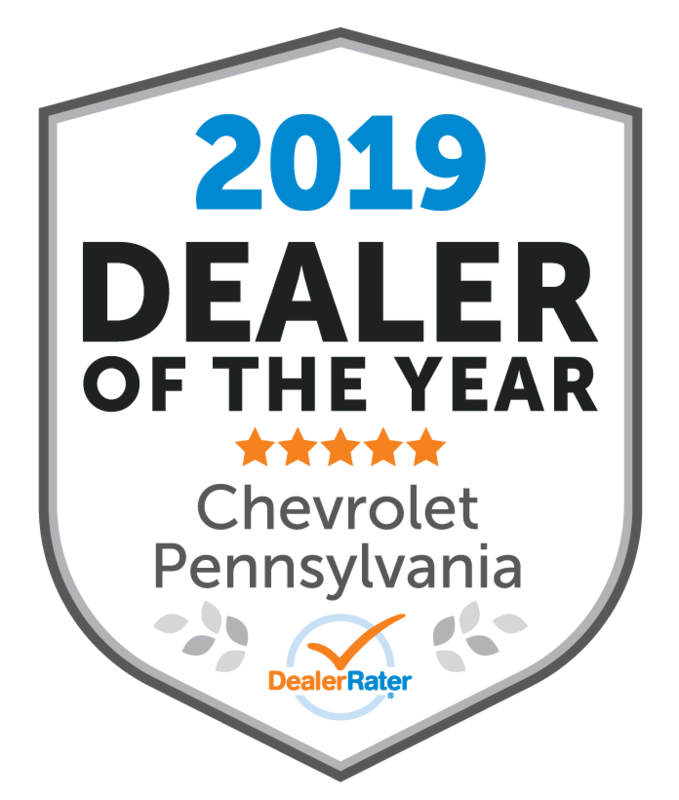 See Wind Gap for all of your Eastern Pennsylvania Chevy Buick Dealership needs! We are driven to serve our wonderful customers. "Long way for a Great Deal"
The staff at Windgap are the best. I would highly recommend shopping with them. They go above and beyond to satisfy and to get you into the car you want. This is the 5th car I purchase with them. 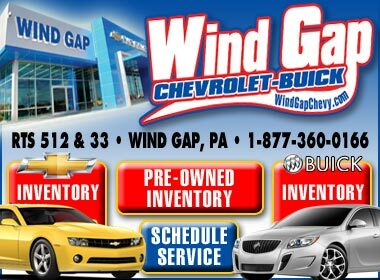 I would highly recommend Wind Gap Chevy! My sales rep, Steve, and sales manager, Rich, were excellent to deal with. They entertained the negotiation aspect of the car buying experience and worked to earn my business. 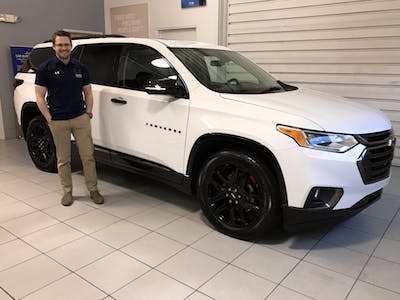 Needless to say, I am thoroughly satisfied with the deal I received, and the new 2019 Chevy Traverse I purchased is a beautiful vehicle! 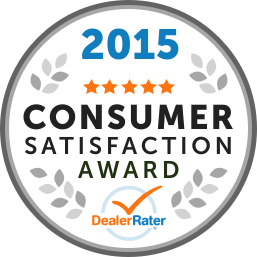 "Very pleased with the Team at Wind Gap Chevy!" 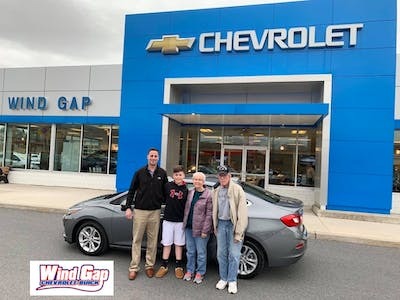 I purchased a new 2019 Chevy Cruze LT from Wind Gap Chevrolet. Let me tell you Cleber, Anthony, Dominic, and Kaity were so helpful and friendly during the process. Including everybody else that worked out the numbers for my new vehicle such as Rich Riehl, Tom Ehrlich, and Jeff Baskin. Great atmosphere and friendly staff in all departments. Thank you for making my experience at your dealership fantastic! Everyone was so kind and helpful, made the process of car buying as painless as it could possibly be. Jeff, Bryan, and JR were so helpful and friendly. I was struck by how friendly the entire staff was, it felt like one big family. Would totally recommend!! 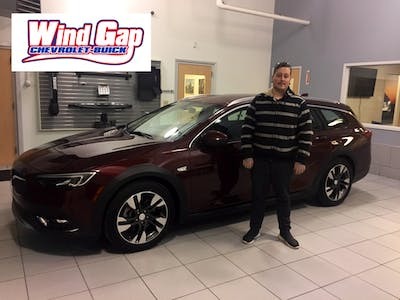 This is our second purchase from Wind Gap Chevrolet Buick! They have an absolutely amazing staff, although Steve Savercool is our favorite! He has such a great personality that makes you feel welcome and makes the whole car buying process more fun and relaxed, which is wonderful because I stress about everything. Lol Their service tops any dealer we have been too, they listen to your needs and wants, there is never any pressure or rushing you in to a decision. I felt I could test drive as many cars as needed, and I did, but the Malibu he pulled aside before we arrived ended up being perfect and had everything I was looking for. Plus it was the color i wanted, he actually remembered from our first purchase! Their service/repair department is great, quick easy and no nonsense. They also were very willing to anwser any questions with out hesitation. Our first purchase had some issues (no fault of the dealer) and there was never any hassle, all it took was a call to schedule. Everything was taken care of quickly! "GREAT PLACE TO BUY A CAR"
My salesperson; Steve Savercool made everything easy and worked hard for me. 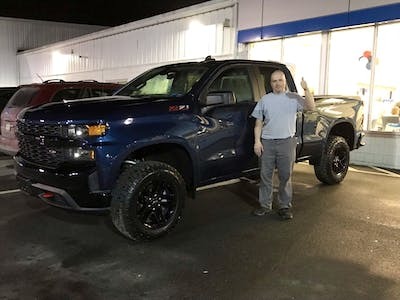 So did others like Anthony Baio and Rich Riehl, they listen and work hard to get the best deal and got the truck I wanted. Many other salespeople were friendly and professional. This place has great people even owners whom will know you by your first name and treat you right. Not like a "big box" dealership! Go to the others to look and come here to BUY! Great team from the Professionals. My guy Steve Savercool very please to work with him for the 2nd time an made things work of my behalf. "Very pleased with Sales Team of Wind Gap Chevy"
the SALES DEPARTMENT is the best around, thank you Jason Kerr and Steve Savercool, also thanks to BK, Sue, Bryan Statler, you cannot go wrong with most of the sales associates here. Steve Savercool is a great personality highly recommendable. And Special thanks Jason Kerr and Rich Riehl working in office their hard work should not go overlooked. I was paying $760./month, NOW, I'm paying $350./month and have same car and a year newer!!!! Try that somewhere else! "Best experience buying a new car"
I walked in unsure of my new car needs after leaving Ray price empty handed and feeling frustrated. Not only was my salesman Cleber Geleski a great sales man he actually listen to what I had to say and walked me through my options and showed me many different vehicles with no pressure,even stuck it out late with me to make sure I got the best rate possible and not taking the first offer from the banks. I wound up getting a better car for cheaper then I ever expected.thanks again for the great experience.